If you suffer from hearing loss, you may be curious to know how your hearing works so as to better understand where the problem lies. Sound waves travel through the air, are focused by the outer ear, and then directed down the ear canal. When sound waves hit the eardrum, this causes it to vibrate. In turn, this movement is passed on to three small bones in the middle ear. The vibration of these tiny bones is transferred to fluid in the cochlea (the inner ear) which causes hairs in the cochlea to bend and sway. It is this movement which generates tiny electoral impulses which then travel up the auditory (hearing) nerve to the brain, where we hear them as sound. The visible part of the outer ear has a number of different names including the pinna or auricle. 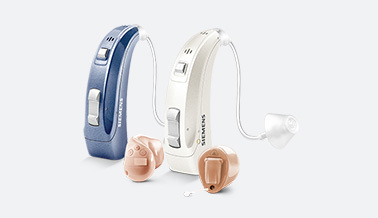 The outer ear is cleverly designed with ridges and grooves, to focus sound and naturally boost those frequencies (2,000 – 3,000 Hz) that contain the consonant parts of speech. Another part of the ear we can see is the entrance to the ear canal (or external auditory meatus). This are is lined a thin layer of skin with fine hairs, and is well supplied with blood. It is normal and healthy for wax (or cerumen) to build up in the ear, unless it forms a complete blockage. This wax has an important function to protect the skin from bacteria, sweat, or indeed water. The ear canal and the middle ear are separated by the membrane you may know as the ear drum (or tympanic membrane – TM) Although thin, the TM is constructed from three layers which increases its strength. The three small bones (or ossicles) mentioned earlier, sit in the middle ear and act on each other in an articulated chain. 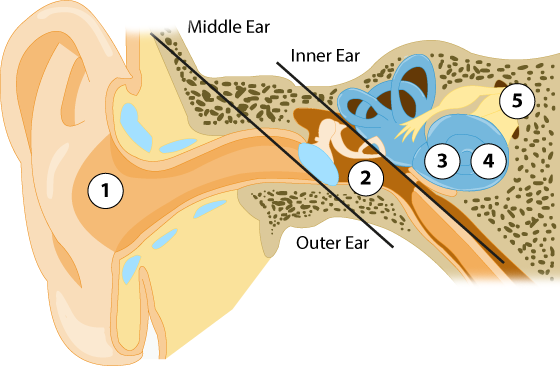 The first bone sits against the inner lining of the tympanic membrane and moves against the second bone which activates the third bone that connects to the flexible window to the inner ear. The job of these ossicles is to transfer the sound waves that made the tympanic membrane vibrate, into a mechanical movement that is transferred to the inner ear. However, the middle ear is occasionally needs to be “reset” such as when you fly in an airplane and the air pressure changes. The Eustachian tube serves this purpose by linking the boney chamber of the middle ear with the throat. This tube is normally closed, but is opened when you chew, yawn, or swallow. This is why you might encounter a popping sensation when you yawn during an air flight – you have just equalized the pressure in your middle ear. The inner ear sits in a small boney chamber within the temporal bone of the skull. The inner ear consists of two important structures: the cochlea and the semi-circular canals. The cochlea looks a little like a snail, which belies its importance as the hearing organ. This fluid-filled structure changes the mechanical vibrations of the tympanic membrane into a series of electrical impulses. This is done when tiny hairs within the cochlea bend in response to vibration. The electrical impulses travel via the auditory nerve to the brain where they are interpreted as sound. The cells are arranged in order of frequency, much like the strings on a piano and code for sounds ranging from 20Hz (low pitch) to 20,000Hz which the limit of a human’s high pitch hearing. Last but certainly not least the semicircular canals have the important function, not of hearing, but of maintaining our balance.